Kerala is popular for its backwaters, Ayurveda, tea plantations, wildlife and much more. Due to its slow-pace of lifestyle, Kerala is one of the favourite de-stressing destinations among modern travellers. But did you know the state which teaches us the approach of ‘take-it-easy’ also has its own crazy side full of speed and adrenaline? Witness one of the oldest events in the history of boat racing in India this July. 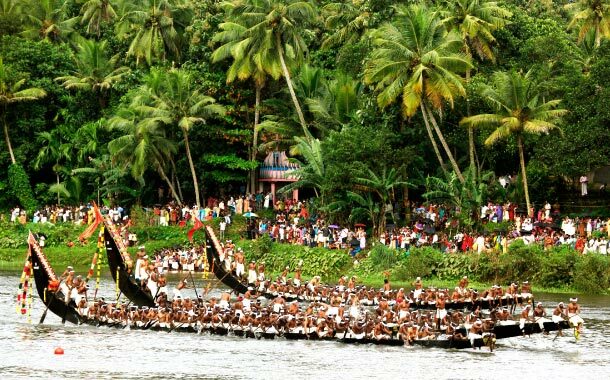 Yes, I'm indeed talking about the most famed snake boat race - The Champakulam Boat Race. Watch the elaborately-decorated chundans or ‘snake boats’ gliding down the waters at an incredible speed. The most praiseworthy feature of this event is the depiction of great team spirit. Even a minute mistake by one person can lead to imbalance. The cheering crowds in tune with the rhythmic chanting of the oarsmen combine to make the boat race a mesmerising spectacle. So hop on a trip to Kerala and encounter one of the best ways to experience the backwaters in God’s own country.